vShare is one of the most popular app to install latest paid apps and games in your iPhone, iPad and iPod touch device. This app is also available for all android version devices. In short we can say it is one customized apple store. vShare gives largest selection of pre-hacked games which already contains million of coins, money to complete complicated game level easily and important paid apps. 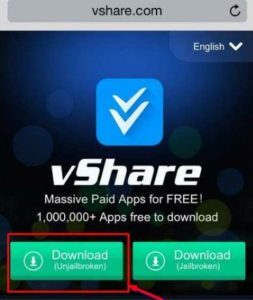 I am going to explain you two different working methods to download vShare app in your iOS device without money and jailbreak. Follow the steps below to success in this amazing app installation. The installation guideline is working fine for iOS 9.3/9.3.2/9.2.1/9.2/10/9.1 Without Jailbreak on iPhone, iPad and iPod Touch devices. You can try those different methods in iPhone 7, iPhone 7 plus, iPhone 7 pro, iPhone 6, iPhone 6S+ and iPhone 6S, iPhone 5, 5S, iPad Mini 2/3/4, iPad Air 2/3/4, iPod Touch 4th Generation, 5th Generation. What do you need to get vShare? The entire process will take about few minutes for download and installation. This method works for any iphone, Ipad, iPod touch device without jailbreak which is running with ios 7, 8, 9, 9.1/9.3.2/9.2.1/9.2/10.0.1 and other latest version. Make sure that you have latest version of iTune store is installed, it’s mandatory. Easily drag and drop music to iDevice directly using vSHare professional. Huge selection of apps with regular update version. Most trustable software as no crash of any device has been reported so far. Open http://www.vshare.com/ into your browser. Click on first download button which is for windows system. vShareHelper_32bit.exe/ vShareHelper_64bit.exe file will be downloaded into your system. Double click on the file to start vShare helper installation process. Launch the app after installation. Connect your iOS device using USB data cable with windows system. 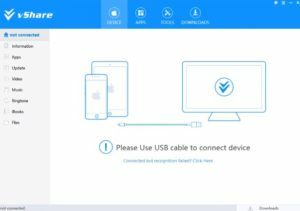 Your PC will automatically detect the device after you made USB connection between iPhone, iPad or iPod touch device and pc. If your pc not able to detect your iOS device then reboot your computer, reconnect the device with different USB data cable. Press on the Install vShare icon and vShare will be installed in your iOS device. Press reauthorization icon after install process. So you can install the app locally in the device without crashing. Success message will pop-up and then press ok.
You can uninstall the vShare helper from control panel – > program file section if not required it anymore. Launch vShare program. Search your app or type app name in search box area to install your favorite app. 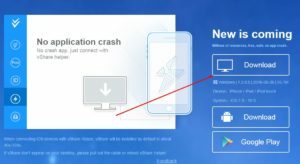 Tap on the any app icon to begin download and installation process without jailbreak within vShare screen. Note: This process works in only iOS 9 and above version device. For any iOS 9 or above device it will show Download (Unjailbroken) and Download (Jailbroken) options. You need to tap on Download (Unjailbroken), a pop-up will execute after download process as “ssl-api.appvv.com would like to install vShare”, and you just need to respond it by tap on install button. Move at home screen to review installation process. Launch vShare app in your iOS device. You may see a pop-up box with title like “Untrusted Enterprise Developer” and message “…Fujian Zheng electronics technology co. Ltd, has not been trusted on ipad/iPhone/iPod. Until this developer has been trusted, their enterprise apps will not be available for use.” Tap on the cancel button to hide this message. To solve this follow below steps. Settings.app -> General -> Profile -> Select Profile -> Trust (find Vshare profile – in our case Fujian Zheng), Tap on trust link first and then trust button. Now launch vShare app, you will be able to open it without any crash of your iOS 9 and above version apple device. You can see list of apps, you can select any app from check in, essentials, best, infinite and free section. You may face errors if your device is not jailbreaking. I am also going to explain you the troubleshooting to solve them. You may get a message ““Unable to Download App: “vShare” could not be installed at this time” and installation will not start. Tap on done button and wait. This may occur because of huge traffic on the server, try to install the app in off hours. Don’t press retry button and uninstall the entire app. Perform new vShare installation again. If you have updated your iOS from old to 10.0.1, vshare may not work in your apple device. To solve this follow below steps. It’s 100 % working and tested method. You can download Hipstore and Popcorn Time app without jailbreak.